Looking at the daily S&P 500 chart below as an overall barometer of risk sentiment, here’s a summary of the primary market drivers behind the daily moves, which accurately reflects what was driving risk assets each day. In the end it’s just more debt for a nation that needs to cut sovereign debt, regardless of whether the conditions attached to this set of loans are somewhat easier. For details on the problem with the Spain deal see last week’s article: THREE REASONS TO PANIC ABOUT SPAIN, EU, AND RAMIFICATIONS. Markets worldwide were modestly higher on hopes for ECB, Fed stimulus. They were hoping for a significant shock and awe program from one or both leading central banks. While the moves higher were modest, when you consider that they occurred against a dour backdrop of deterioration in the EU, US, and China, it’s clear that hopes were high, with many analysts and institutions publicly predicting a significant liquidity boost. While similar actions in prior years have had done little besides pile on more debt and produce a temporary pop in risk asset prices, that short term rally was what markets were hoping to play. Risk assets retreated from their highs in the US session after a German official doused hopes that the EU would use rescue funds to buy GIIPS bonds. Markets continued to move with hopes for a big new Fed stimulus plan, again not because this has solved anything in the past, but because they wanted to play the short term bounce higher. News of a coming wave of major bank downgrades from Moody’s (out after US markets closed), compounded by disappointment about the lack of central bank aid, and by weak economic data worldwide, sent the index diving 2.23%, erasing and eight session uptrend that began on June 12th, for its biggest loss in 3 weeks, and its third loss in June to exceed 2%. The fear arising from the bank downgrades, compounded by the weak data which further confirmed the picture of slowing growth worldwide, was THE market mover of the week. Asian markets were down due to weak macro data from China, Europe, and the US, European markets were down mostly on the combination of weak data and continued German opposition to looser ECB collateral rules (pretty loose already) or material changes to Greece’s debt deal. The Germans know Greece can’t pay under the current conditions but fear than any renegotiation would lead to similar deals for the other GIIPS and thus more hits to EU banks and other private sector creditors. That would mean GIIPS debt is now riskier and cause GIIPS sovereign and bank borrowing costs to rise, pushing Spain and Italy closer to needing a full bailout which the EU can’t afford. That risks the same collapse that the coming Greek default would bring. In sum, they’re damned either way. More on this below. US markets opened higher and advanced to close up on Friday. That’s because they shrugged off their main concern Thursday, the Moody’s bank downgrade. After a day’s reflection, markets appear to have concluded that Moody’s was just catching up to the current reality. Indeed, one could argue the banks are no worse off than they were at the start of the crisis, perhaps even in better shape, so calling them worse than what they were in 2008 appears a bit of a delayed reaction to a reality that’s already been discounted. So what are the key take-aways? 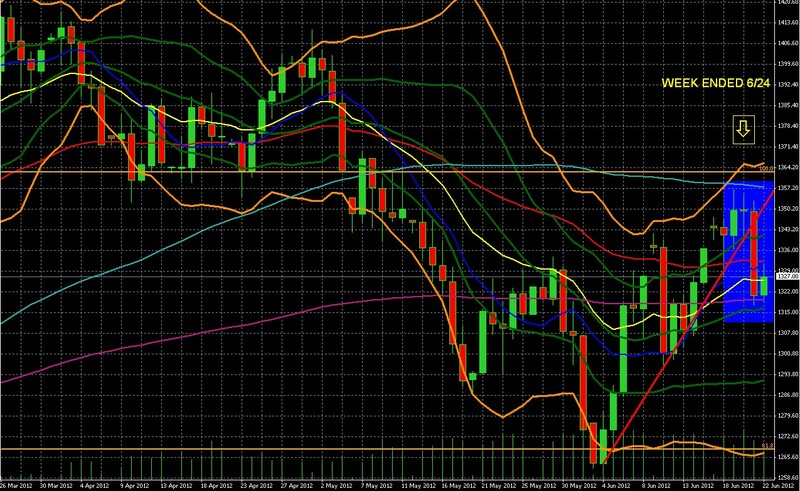 It has also lost its strong upward momentum, as shown by the closing price falling below the double Bollinger band buy zone (the area bounded by the upper orange and green Bollinger bands). For those seeking a review of this concept see: 4 RULES FOR USING THE MOST USEFUL TECHNICAL INDICATOR, DOUBLE BOLLINGER BANDS. After a 5 session break above its 50 day EMA (red) the index has come back below it. Another sustained move lower could bring that falling 50 day EMA to cross below its 200 day EMA (purple), forming a very bearish “death cross” that tends to signal a longer term downtrend ahead. As noted above, Germany and the other funding nations have a dilemma, which dooms the EU unless the there are some radical changes in policy from the funding nations and all suddenly decide to cede key parts of their sovereignty. Firstly, easing up on the Greeks creates some unacceptable problems. It means hitting bondholders again, scaring credit markets and seeing all GIIPS bond costs rise. That puts Spain and Italy at risk of default (too big to rescue), and they must avoid insolvency if the EU is to survive in its current form, if at all. Secondly, all other GIIPS would want at least as good a deal, which would inflict further losses on the private sector, make GIIPS bonds riskier still, and further complicate keeping Spain and Italy solvent. However, Greece can’t meet its current obligations, so given Germany’s current position; it will not get more cash and will default. That risks essentially the same fatal consequences noted above – higher borrowing costs for Spain and Italy, risking a default by one or both that would finish off the EU as we know it. The only solution involves some kind of unconditional guarantee of EU bank deposits. That would require all EU members to cede control over their budgets and thus cede much of their actual sovereignty. It is far from clear they are willing to do that. Even if they were, it would take time to agree to the terms of the US of Europe, states’ rights, etc. The US needed about a century and civil war, and had far fewer cultural, regulatory, and linguistic barriers to overcome. What is the final catalyst? Is it a Greek, Spanish, or Italian exit and default? Or, does the EU, lead by now socialist France, rebel against German leadership, opt for money printing and a devalued Euro, and Germany exiting and returning to the Deutschemark? The likely result appears to rest on which option Germany believes to be less dangerous (or more affordable). Looking longer term, it appears clear that the most widely held currencies will be subject to policies that will undermine their value, even though the ongoing global slowdown may defer the loss of purchasing power in the near term as deflation remains the bigger threat. This means that just as any prudent investor would diversify their holdings by asset type and sector, they need to also diversify their currency exposure. Most investors remain almost exclusively in one or two currencies. Those based in the USD, EUR, JPY, GBP or others in similar straits risk seeing otherwise solid performance (hard enough to achieve) wiped out by loss of purchasing power of their local currency. Until recently, simple, safe solutions to the dilemma of how to achieve currency diversification were unavailable or very hard to find. No more. Coming out this September is the book, THE SENSIBLE GUIDE TO FOREX, SAFER, SMARTER WAYS to SURVIVE and PROSPER from the Start. It’s got a full range of solutions for both investors and traders. See here for a full description, and here for advanced reviews. We recommend placing an advanced order, which allows you to reserve a copy, lock in the lowest price and also get any future price reductions before the release date. You can’t lose. Over the coming months we hope to release some excerpts for your examination, because amazon.com and other sites won’t allow peaks at the text until the book is already released. Included in this, a summary of a 50 page study that’s the only objective look at binary options extant. The full version will also appear on the website http://www.thesensibleguidetoforex.com as soon as time permits. Proceed to Part 2 for preview of coming week market movers and how to know right away if next week’s EU summit actually accomplished anything.